If a diesel Volkswagen is what your heart truly craves and desires, you can buy one of the later ones, as they’ve been fixed and are up for grabs at dealer lots. Our Managing Editor Erin even bought one. She loves it. The vast majority of the parked cars are the earliest versions of what VW once called its ​ “clean diesels.” These first-generation diesels, bought back from consumers, used an illegal software defeat device that allowed the cars to cheat on U.S. clean air standards in what became a global scandal for Volkswagen Group, costing the company tens of billions of dollars and sending two employees to prison so far. Later VW diesels that were recalled have had their fixes approved by regulators and have returned to dealership lots. VW fixed and returned for sale about 8,000 of an estimated 70,000 Passats with the later engines. Fixing the first-generation diesels requires significantly more work, however, which will be done at VW dealerships, a spokeswoman said. 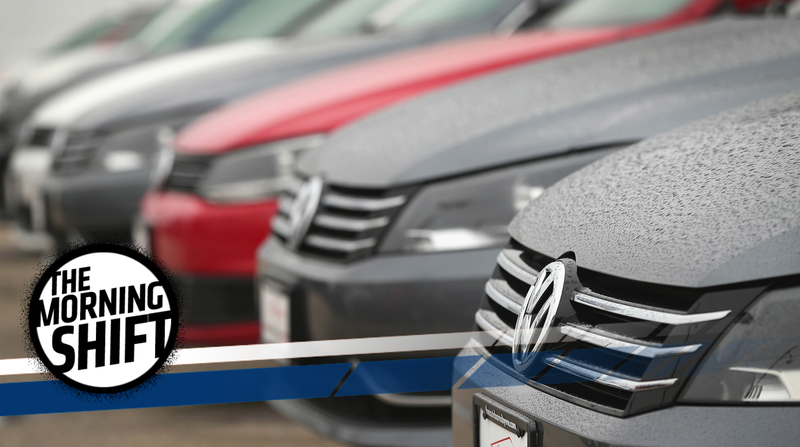 Automotive News reports that VW purchased around 67 percent of the 485,000 cheating diesels it sold in the U.S. between 2009 and 2014, most of which will be fixed. The older cars with higher mileage and lower resale value, though, VW said they’ll be scrapped because it “doesn’t make sense anymore” to fix them. Avis Budget Group Inc.’s Budget website shows Hyundai Elantra compact cars are available starting Thursday for $55 if paid in advance or $78 if settled at Hobby Airport, more than double the $36 drivers would pay at the same counter 30 days later. Avis had a Chevy Cruze on offer for Thursday for $57 in advance — or $123 at the counter — versus $43 if rented in advance for October. .. Some of the higher prices for Houston rental cars may be more related to seasonal factors than rental companies trying to take advantage of tight supply, said Neil Abrams, president of Abrams Consulting Group Inc., which tracks rental car rates. Prices often climb after Labor Day when business travel spikes, with the national average for a weekly car rental climbing to $330 this week from $225 before the holiday, he said. Bloomberg reports that Enterprise hasn’t had any rental cars available for retail customers since last week, and that the vehicle shortage is partly due to rental businesses giving priority to company car reservations for Federal Emergency Management Agency personnel, insurance staff and other people going into Houston to respond to storm aftermath. Volkswagen CEO Matthias Mueller’s contract is up in 2020, which is still a few years out. But Bernd Althusmann, the person leading the state election in Lower Saxony, Germany, VW’s second-largest shareholder, told Reuters someone from outside of the auto industry should take his place. Mueller, 64, said earlier this year that VW is likely to pick his successor from within its own ranks. The previous head of VW’s Porsche brand has been with the German group for four decades and became its CEO a week after dieselgate broke, forcing Winterkorn to resign. “Perhaps it is good after all to pick someone who is completely unstressed by all conceivable automobile scandals but who still has an affinity towards this important industry,” Bernd Althusmann said, without suggesting names. Althusmann’s comments follow the news that current Lower Saxony Premier Stephan Weil, whose SPD party is forecast to lose the next regional election in October, allowed Volkswagen to vet a speech he made about the diesel scandal. All of that isn’t just political talk. Reuters reports that if Althusmann wins the election on Oct. 15, he’ll join the VW supervisory board and be able to push his opinion about the next CEO. Personal car sharing is the future, or so they say, and it sounds like Daimler is really into a startup that takes 25 percent of the cut for each sharing transaction—like, millions and millions of dollars into it. Bloomberg reports that Daimler and South Korean conglomerate SK Holdings led a $92-million investment into car-sharing service Turo, which lets people rent out their personal cars and takes a huge chunk of the rental price for itself. The report didn’t say how much each put into the $92 million, but did say that the investment was to help Turo weather attacks from traditional rental companies. The new funds will go toward growth in Germany, where Turo will take control of Daimler’s struggling Mercedes auto-sharing service Croove, and throughout Asia. The investment values the nine-year-old company at about $700 million, nearly double the last round, said Chief Executive Officer Andre Haddad. Traditional car-rental companies have Turo and its competitors, Drivy and Getaround, in their sights. They believe car-sharing services are illegal because the businesses skirt tourism taxes. Bloomberg also reports that the American Car Rental Association, which lobbies for Enterprise, Hertz and other big rental companies, is pressuring lawmakers to get rid of the tax loophole. If the group does succeed, Turo will at least have some extra funds to kick back on while it reevaluates its tax situation. Since autonomy is now in levels because companies can’t just use their words, a Level 4 car can drive with no human intervention in most environments. The venture will use AImotive’s artificial intelligence software and hardware in PSA vehicles to test adaptive cruise control, automated lane changes, changeovers between human and autonomous driving and collision avoidance. The pilot will be deployed on French highways at speeds up to 80 miles an hour. The companies did not say when the pilot would launch or how many vehicles will be involved. The companies began work on the project in May, installing AImotive’s hardware and software in a Citroen C4 Picasso. The technology has already undergone preliminary testing in a proving ground in Hungary, where AImotive is based. The pilot will also use simulations to virtually test the platform. AImotive has been around since 2015, and, like most self-driving technology startups, isn’t building its own cars. The startup needs PSA for the cars, and PSA needs the startup for the technology. It’s like a good marriage. Or something. An aircraft looped the loop for the first time ever on Sept. 6, 1913, according to a Fullerton College webpage. That must have been, uh, terrifying in 1913 aviation technology. Bravo. The pilot was Adolphe Pégoud of France, who died at 26 years old in 1915 after Atlas Obscura reports that his World War I plane was shot down from 6,000 feet. Neutral: Would You Buy An Older VW Diesel? Maybe you could get a really good deal on a 2009 or 2010 TDI that (wink, wink) totally isn’t cheating emissions anymore.